(NaturalNews) If health authorities are going to remain insistent upon lacing the water supply with additives to thwart tooth decay, then they really should be using all-natural coconut oil rather than fluoride chemicals, based on the findings of a new study. Researchers from the Athlone Institute of Technology (AIT) in Ireland have found that coconut oil effectively inhibits the growth of harmful bacteria that can cause cavities and mouth infections, without causing any harmful side-effects. For their study, a team of researchers from the school added enzymes to coconut and several other oils to mimic how these oils would normally be processed during digestion. The team then applied the digested form of each of the oils to several strains of bacteria, including Streptococcus mutans, a common acid-producing bacteria often found inside the mouth, and Candida albicans, a highly problematic yeast strain that can cause oral thrush infection. What they discovered was that only the coconut oil exhibited clear antibacterial and yeast-fighting properties when exposed to the different bacterial strains. In fact, enzyme-modified coconut oil was found to fight all sorts of bacterial strains without triggering any negative side-effects, or promoting the development of antibiotic-resistant "superbugs" like antibiotic drugs do. "Incorporating enzyme-modified coconut oil into dental hygiene products would be an attractive alternative to chemical additives (like fluoride), particularly as it works at relatively low concentrations," said Dr. Damien Brady, lead researcher from AIT, about coconut oil's amazing antibacterial power. "Also, with increasing antibiotic resistance, it is important that we turn our attention to new ways to combat microbial infection." Adding to this sentiment, Dr. Brady also noted that the human digestive system naturally exhibits antimicrobial activity, at least when it is given the proper foods and nutrients. 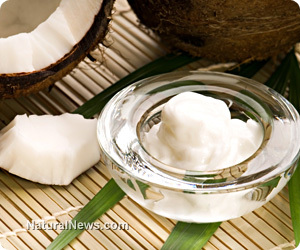 Consuming more coconut oil, in this case, can effectively boost immunity and thwart the onset of harmful, disease-causing pathogens in the mouth and elsewhere throughout the body. What is particularly interesting about these dramatic findings is that coconut oil was demonstrably shown in a credible study to fight harmful bacteria and prevent tooth decay. Fluoride, on the other hand, which is pumped into water supplies nationwide that hydrate millions of people, has never been legitimately shown to fight or prevent tooth decay when ingested. What this new study on coconut oil actually helps unearth is the fact that water fluoridation is a complete scientific fraud. Not only has fluoride never been proven to prevent tooth decay when ingested, but recent studies have actually shown that fluoride harms teeth. Ingesting fluoride, it turns out, can cause dental fluorosis, as well as some other very serious health problems in the long term. Coconut oil, on the other hand, will not only help protect your teeth against bacterial rot, but it will also help improve digestion and metabolism, promote heart health, boost energy levels, and strengthen immunity (https://www.naturalnews.com/Infographic-Benefits-of-Coconut-Oil.html). Since ingesting coconut oil converts it into a powerful bacteria-fighter, as illustrated by the study, "swishing" coconut oil can also promote improved oral health via the enzymatic activity of its mixing with saliva.